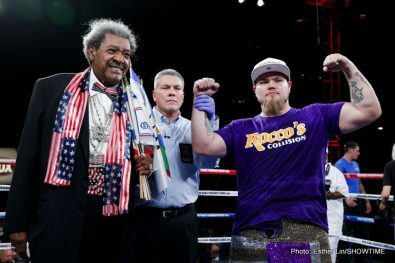 On a hot summer August night, in a specially-constructed ring outside the Downtown Las Vegas Events Center (DLVEC) across from the D Las Vegas, Trevor “The Dream” Bryan remained unbeaten and passed the toughest test of his career with a crowd-pleasing, hard-fought 10-round unanimous decision over Derric Rossy in the main event of a ShoBox: The New Generation tripleheader live on SHOWTIME®. 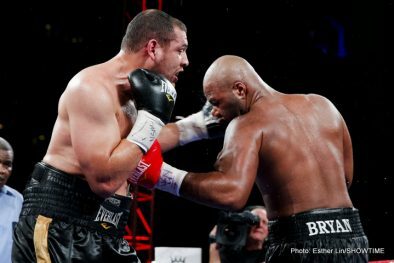 Bryan (16-0, 11 KOs), of Albany, N.Y., dropped the vastly more experienced Rossy (30-10, 14 KOs), of Medford, N.Y., with a flurry of punches 30 seconds into the fight en route to winning one of the most exciting heavyweight fights of the year by the scores of 98-91 twice and 97-92. 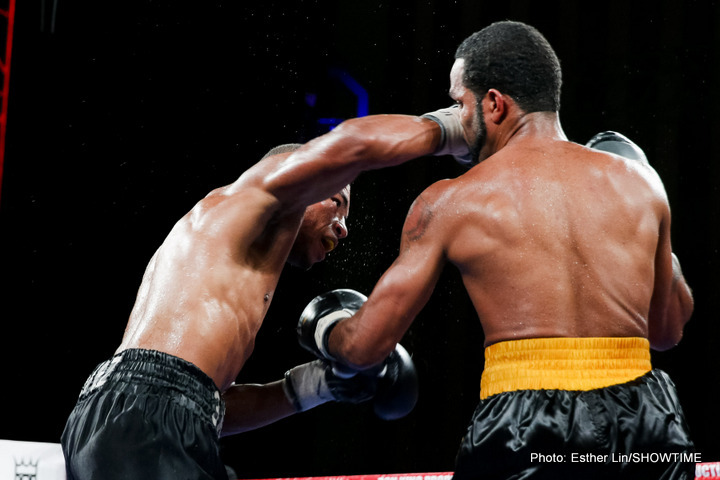 Round 3 of the slugfest could be a candidate for Round of the Year. 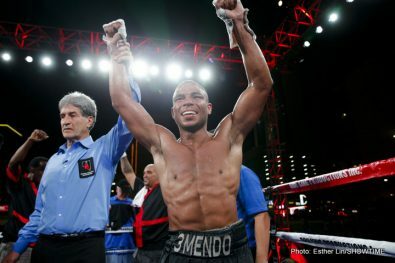 In Friday’s co-feature, middleweight DeCarlo “3-Mendo” Perez (15-3-1, 5 KOs), of Atlantic City, upset previously undefeated Juan Ubaldo Cabrera (23-1, 16 KOs) of the Dominican Republic on a unanimous 10-round decision. 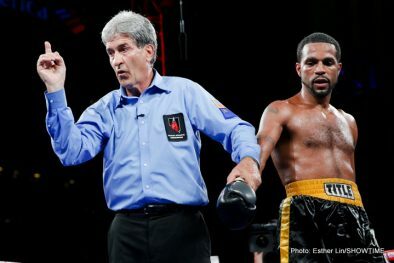 Perez, who took the fight on a week’s notice, beat the two-time Dominican Republic Olympian by the scores of 98-91 twice and 97-92 in a match that featured steady two-way action for the most part. Cabrera became the 134th boxer to suffer his initial defeat on ShoBox. 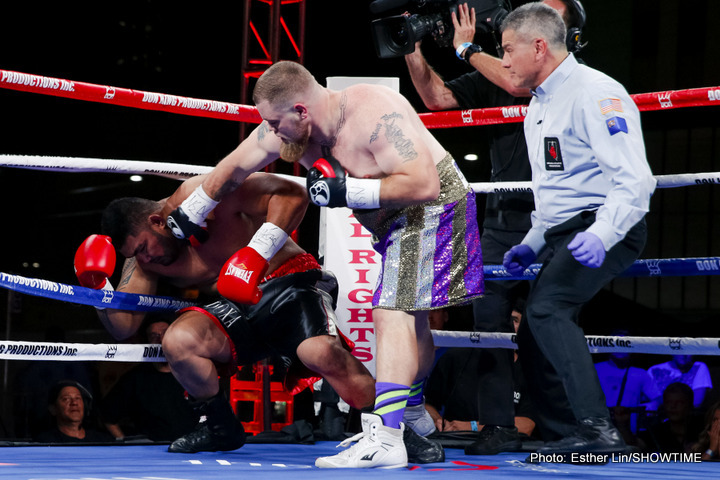 In the opening bout of the telecast, heavyweight Joey Dawejko (15-4-2, 7 KOs), of Philadelphia, registered an impressive 1:15, first-round knockout over Samoa’s Natu Visinia (11-2, 9 KOs) of Tacoma, Wash., in a scheduled eight-round scrap. 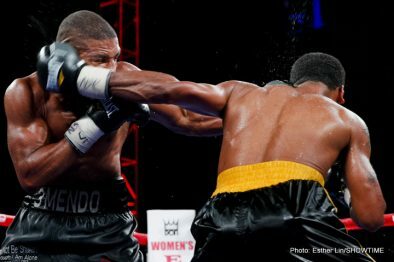 “We saw two drastically different types of heavyweight fights tonight,’’ said boxing historian and ShoBox expert analyst Steve Farhood. “One quick bang-out — where Joey Dawejko made a lot of fans. I think people would like to see him again, I’d like to see him again. And the second fight, Trevor Bryan, he didn’t get the stoppage but he also gained a lot of fans. He’s a fighter that most fans have not seen, and tonight he was introduced on the big stage in a very successful way. “Derric Rossy showed such resistance and that made the win sweeter for Bryan, who had never fought anybody resembling the class of Rossy. It was a physical fight with a lot of good exchanges. Trevor Bryan stamped himself as a young American heavyweight to watch. Hall of Fame promotor Don King was ecstatic afterward. 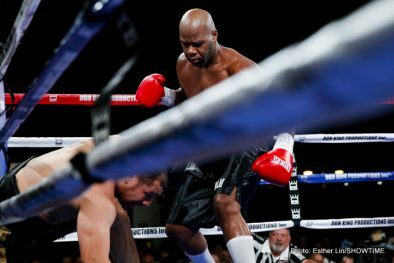 “It was great to see heavyweight boxing back to what it is supposed to be — you are hanging on the edge of your seat with every punch,’’ he said. “You don’t know what’s going to happen, but Trevor Bryan pulled through. He’s only 16-0 but he broke through the door to greatness. That’s the big thing. Now we have to look for him to get a heavyweight championship fight as he goes along. The 6-foot-4 Bryan, who turned 26 on Aug. 23, went 10 rounds for the first time. A pro since November 2011, he had registered 10 of his 11 knockouts victories in three rounds or less. “I think I showed to people that I like to fight and that I will fight,’’ Bryan said. “The heavyweight division is weak. Guys don’t like to throw a lot of punches. Being this was my first time on television, I think I had more anxiety than anything, but overall I was very happy with my performance. “Rossy is a very durable, experienced guy. For him to hang in like he did says a lot. I know I definitely hurt him a few times but I didn’t follow up with the right punches. I didn’t place my punches like I should have after he was hurt. I know I need to relax more and listen to my corner. 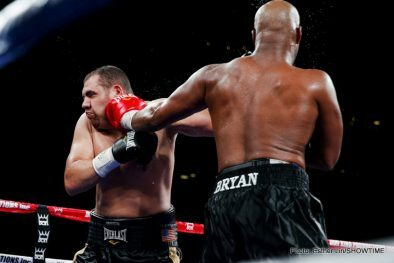 Rossy pushed Bryan in many of the rounds, making for ferocious exchanges that had the crowd on their feet. The 35-year-old gamer has been on the wrong end of many close decisions in the past, but he had no qualms with the verdict this time. “Bryan is definitely a good fighter, talented and he hits hard,’’ said Rossy, who has been in with some of the best in the division. “But after the knockdown, I was fighting on all heart. It wasn’t my plan to stand and slug and make it a war, but once I got dropped my strategy went out the window. 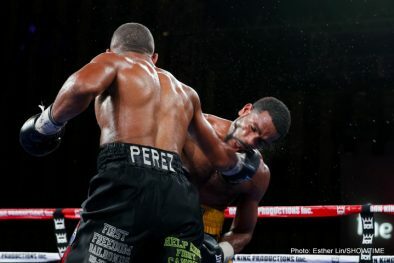 Despite having little time to prepare, Perez, 24, won his fourth in a row and is 9-1 in his last 10 fights. “The heat [close to100 degrees] was no factor, I’ve been training in a gym that has more humidity than this,’’ he said. “The tough part was not knowing anything about my opponent; we saw no film so I had to adjust on the fly. “I knew I’d be getting stronger as the fight went on. To keep throwing punches and dishing out punishment, that’s my style. “This should open up a lot of doors for me. What I did tonight was prove what intense work ethic, pushing and fighting through all the odds, can do. I am very happy and already am looking forward to my next fight. 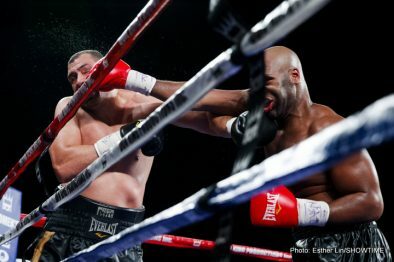 The 5-foot-10 Dawejko, despite giving away five inches in height and being outweighed by 37¾ pounds, came out firing and hurt and staggered Visinia with an overhand right to the side of the head. He followed up with a flurry of punches to the head and body. 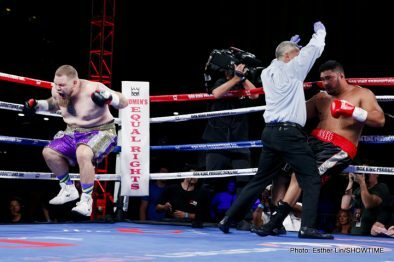 After Visinia was given a standing eight-count, Dawejko landed eight unanswered punches before the referee stepped in and stopped it. 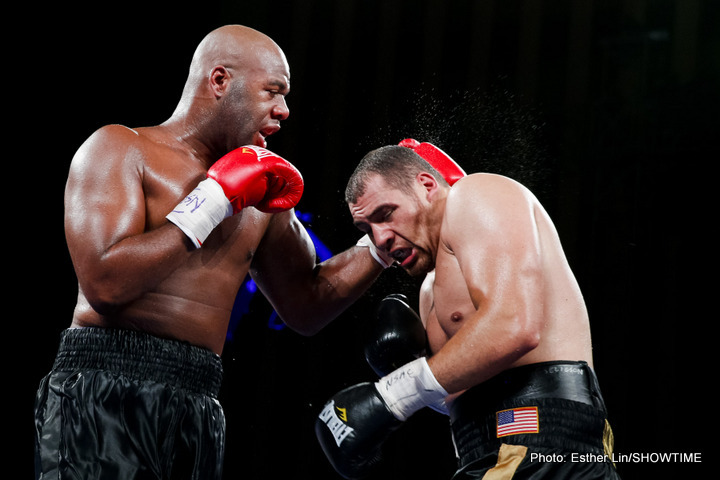 “I thought I would knock him out but not that fast,’’ said Dawejko, who outlanded the Samoan 18-1, 16 of them power shots. “Natu’s a tough guy. My plan was to tire him out and take him out in the fourth or fifth. 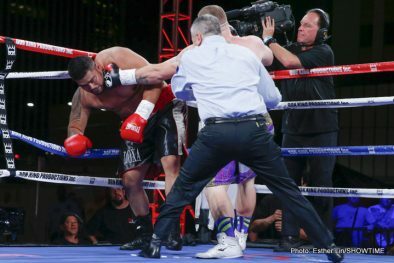 Going in, Visinia was regarded as perhaps the most promising up-and-coming Samoan heavyweight since former longtime contender David Tua. 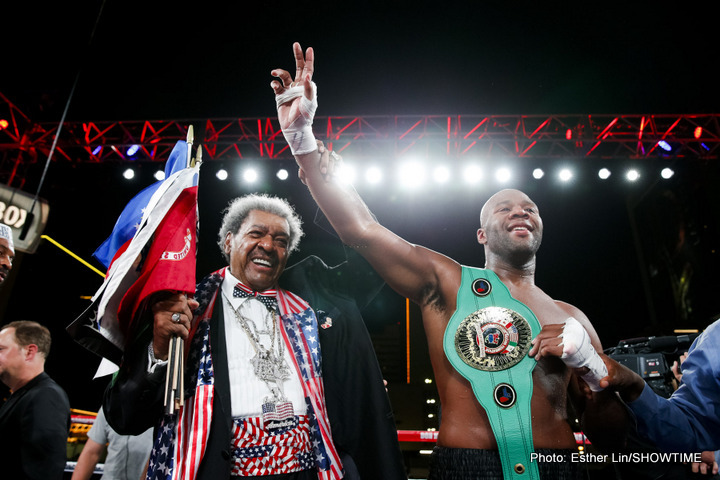 Aired during the telecast was an exclusive taped interview with Floyd Mayweather and Jim Gray and a live interview with WBC Super Middleweight Champion Badou Jack and Farhood. Mayweather (48-0, 26 KOs) will put his undefeated record and WBC and WBA Welterweight World Championships on the line against power-punching, two-time welterweight world champion Andre Berto (30-3, 23 KOs) and Jack (19-1-1, 12 KOs) will make his first defense against mandatory challenger “Saint” George Groves (21-2, 16 KOs) on Saturday, Sept. 12 at the MGM Grand Garden Arena in Las Vegas, live on SHOWTIME PPV®. The four-fight pay-per-view telecast starts at 8 p.m. ET/5 p.m. PT. Friday’s three-fight telecast will be available at SHOWTIME ON DEMAND beginning today, Saturday, Aug. 29.